When it comes to running a business, efficiency is the name of the game. You can’t spend extra time and effort working on a project for two hours when it should only take you one hour. Time is money, as they say. And the same goes for team building. While it is a great way to increase productivity and efficiency, team building is only beneficial if you do it right. But what exactly does that mean? When done the right way, team building can become a priceless piece of the corporate puzzle, increasing efficiency, morale, productivity, and ultimately profitability. The phrase win-win doesn’t even begin to describe just how beneficial team building can be. But the key takeaway from this is “When done the right way.” You see, many people have misconceptions about what team building is. Some confuse team building with morale building: fun activities designed to increase employee happiness for a short period of time. OAnd others believe team building to be simple: something anyone can do or, better yet, lead. Quite the opposite, actually. So, without further ado, here are the top Do’s and Don’ts of Team Building. Truly immerse yourself in the team building experience. It helps if you explain what you are doing and why. Better yet, have your program facilitator come up with a pre-event task for each team so they are already focused when they arrive. If you are skeptical, team building exercises your staff will pick up on these cues and not value the experience. It’s so easy a caveman can do it. Sorry, this is not the case with team building. Not only do team building professionals know what they are doing, but it is often most helpful to have someone outside of your organization facilitate the event who does not have biases and preconceived notions about participants. Team building exercises are only part of the equation. The other is reflection. It is important to talk about the exercise (e.g. what just happened, why is it important, so what now?) to get value out of what just happened. Remember groups learn from failure as well as success. The only way team building is going to be successful and fundamentally change your corporate culture is if everyone participates: employees, management, and even the owner. The most effective team building occurs when everyone is participating, as equals. Team building is a time to encourage everyone to explore new roles. Don’t simply allow managers to manage and employees to follow. If anything, reverse the roles. Team building is designed to help bring people out of their shells and learn how to better communicate as a group. Terrapin Adventures has spent years perfecting its team building programs. Our years of experience in the corporate workplace allow us to apply the lessons we’ve learned to our Team Building Programs, in turn, achieving meaningful outcomes. Presented in a fun and creative way our group facilitators and guides will lead your group through unique events that are designed to not only boost morale, but also break down barriers and foster better communication and collaboration amongst your employees. In layman’s terms, our team building programs are designed to help your employees work better, as a team. 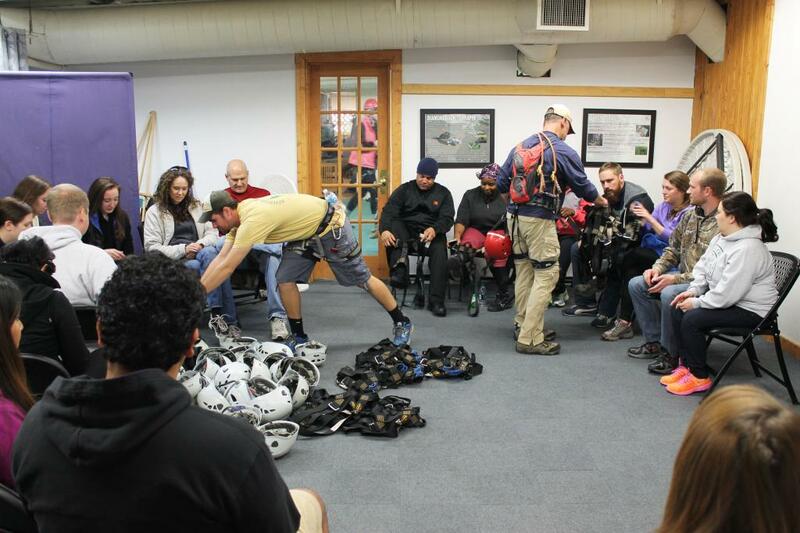 Terrapin Adventures’ team building programs can accommodate up to 200 people, either at our facility in Savage Mill, Maryland or at your facility. That’s right; we can even come to you. In order to design a day that is customized to meet your own objectives and goals complete our Inquiry Form. Meanwhile, if you have any questions about Team Building, please call Terrapin Adventures at 301.725.1313, email us at info@terrapinadventures.com, or fill out the contact form on our website. This entry was posted on Thursday, February 12th, 2015 at 10:41 pm. Both comments and pings are currently closed.